What the World's best photography is made from. The Leaf Credo 40 is the fastest in the Credo family, delivering stunning 40MP shots at a dizzying rate of 1.2 frames per second. Its 43.9 x 32.9 mm CCD sensor offers 40MP resolution with 6.0 micron sized pixels. The Leaf Credo delivers the stunning, film-like quality that has been Leaf’s trademark for many years. 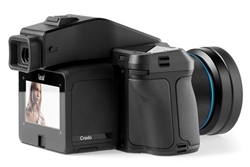 The large, specially designed CCD sensors in the Credo 40, 60 and 80 and the Credo 50’s CMOS sensor with dynamic range of up to 14 f-stops provide unmatched detail, richness of color, low noise and beautiful tonality. Lossless 14/ 16-bit file compression accelerates file handling without loss of image quality.